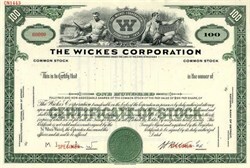 Beautifully engraved SPECIMEN certificate from the Wickes Corporation. This historic document was printed by the American Bank Note Company and has an ornate border around it with a vignette of the company logo between 2 allegorical men, one reading a sheet of paper and one holding a sledge hammer. This item has the printed signatures of the Company's President ( Harvey Randall Wickes ) and Secretary ( Melvin J. Zahnow ). In 1947, Wickes Boiler, Wickes Bros., and United States Graphite merged and Wickes Corporation was born. Harvey Randall Wickes became the new company's President and served in that capacity until 1964. Today, Wickes Inc. is a major supplier and distributor of building materials. The Company sells its products and services primarily to residential and commercial building professionals, repair and remodeling contractors and, to a lesser extent, project do-it-yourselfers involved in major home improvement projects. At March 24, 1998, the Company operated 101 sales and distribution facilities in 23 states in the Midwest, Northeast, and South and 10 component manufacturing facilities that produce and distribute pre-hung door units, roof and floor trusses, and framed wall panels.